Poker is almost the ultimate casino game; it’s a combination of luck and skill with many varieties and millions of players around the world. While Texas Hold’em tends to dominate the poker arena these days there are plenty of other ways to play the game, many with subtle difference that alter the gameplay significantly. Modern day poker is a relatively recent construct and it’s origins are still the subject of some debate. A number of variations were certainly in existence in the 19th century but certain scholars will claim it derives from games which are much older – including Persian and Chinese forms. The more accepted current view is that poker involves betting and bluffing strategies which did not appear until the 19th century and that’s a good place to start. 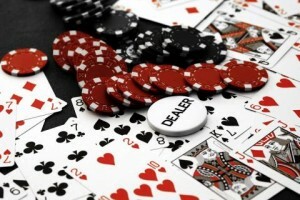 Poker in one of it’s current forms was certainly played on Mississippi river boats at the beginning of the 19th century and it was this connection with the burgeoning casino industry which gave the game a timely boost. Westward migration and the gold rush in the United States spread poker in various geographic directions and as time progresses, various styles of play were introduced. Draw Poker – players are dealt a complete hand and must then try to improve it by replacing cards from the deck. Five Card Draw is the best known example. Community Card Poker – players are dealt a partial hand and must use these plus face-up community cards (shared cards) to create a complete hand. Texas Hold’em is a variant. Stud Poker – players must form a hand from face-up and face-down cards over more than one round. Seven Card Stud is probably the most popular variant. Our recommended casinos feature live poker cash games and tournaments but single player versions and video poker are also available. Click on the games below to check out our reviews.